The words ‘stunning & contemporary’ get used often in describing certain properties, here these words seem understated! If you’ve been looking for the ultimate 5-6 bedroom executive family home (over 650m2+ under roof) with every ‘mod-con’ existing – you’ve found it! Only upon viewing will you be able to appreciate this property in its entirety. 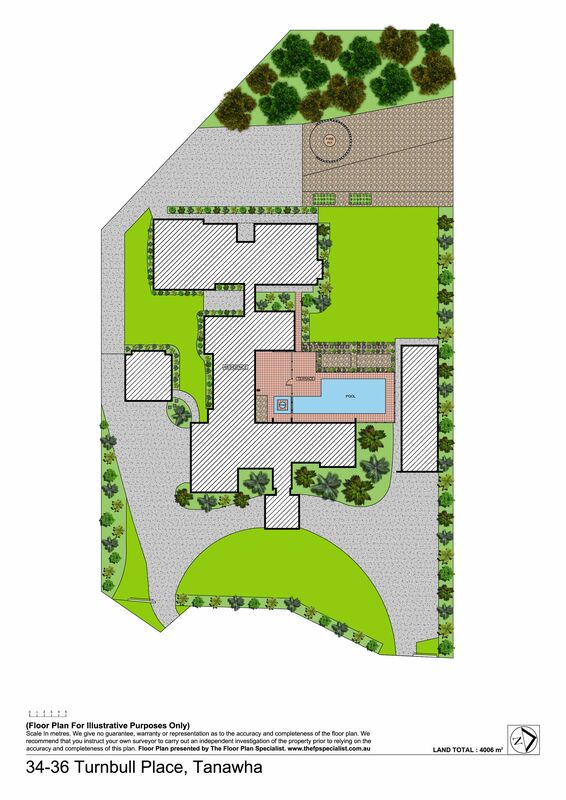 Set on a magnificent, all usable and private 4,006m2, the generous layout offers multiple living areas internally and externally. The entrance at the end of the private cul-de-sac leads through a fully fenced security gate system which steers toward the grand port cache or the 6 secure lock-up garages, one is large enough for a motorhome, boat and/or caravan. 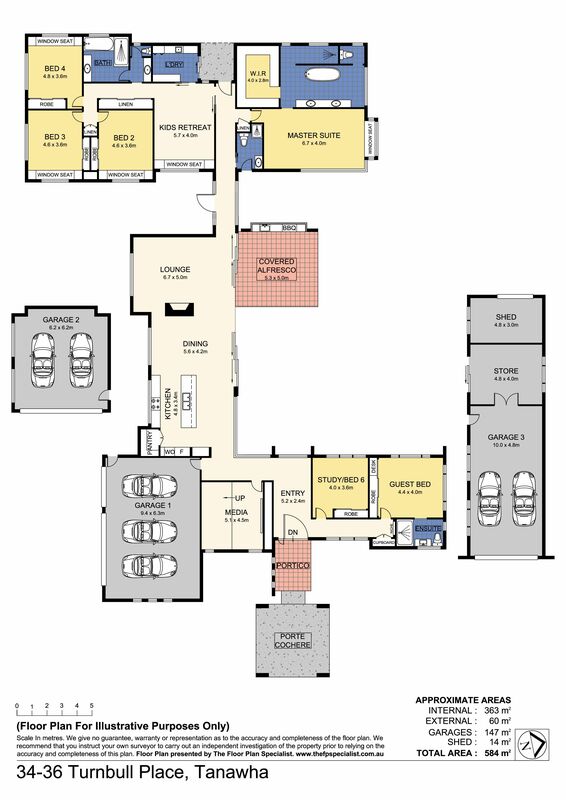 Complete with 5 bedrooms and 4 bathrooms, there is potential to convert the 6th space (with built-in wardrobes) which is currently allocated to a home office, to a 6th bedroom. The guest room at the front of the property has its own allocated ensuite, while the three bedrooms positioned in the ‘kids wing’ have an allocated bathroom, separate toilet and separate vanity outside of the single vanity in the bathroom. The kitchen, dining and living area are located centrally overlooking the glass fenced sparkling in-ground pool. The kitchen bar has enough space for 5 bar stools and features an induction cook-top, Miele appliances, soft closing drawers and an electric bin. The large dining area fits an 8 seat table and is positioned beside the two-way fireplace (with a feature stone wall) which fits a flat screen television on the living zone side. The internal entertaining zone opens up generously and seamlessly to the external area where there is an in-built BBQ area. Alongside these zones are various flat grassed areas for the kids to play, large enough to fit a large trampoline and fully fenced for the animal security. There is an assigned toilet to service the pool and outdoor areas, with side access. The master suite is finished exquisitely with an extra large ensuite, stand-alone bath, double shower and vanity and large walk-in wardrobe. The separate kid’s wing can be closed off from the rest of the residence. A separate living zone which could be made into a rumpus or playroom is positioned with the 3 bedrooms (all complete with bay style window seats and carpet) in this area with the laundry which has external access and extra storage space. Extra property features include a fully equipped media room with 7 reclining seats a raised viewing, a gymnasium which could be converted to large home office or dual living space for teenagers or elders, storage shed and rainwater tank behind gymnasium area and a concrete hardstand ideal for another shed/basketball court/activities for the kids. Conveniently located within the prime smorgasbord of private schooling options and the University of the Sunshine Coast, as well as a quick 5-minute drive to Buderim Village and amenities. Pristine Mooloolaba and Alexandra Headland beaches are only 10-15 minutes (approximately) and the upcoming new SunCentral Maroochydore CBD. This is as good as it gets! Don’t miss the opportunity to view, call Craig Porter to organise a private tour on 0411 554 880.